Do you like your Blues to Rock? How about loud? Who doesn’t love a bit of peace? But what about love, ya gotta love love!? If you said yes, then Anthony Gomes is your man. AG can go from 0-110 in a single note and then land you in a sweet soulful place. In the finest tradition of Rock born of Blues, AG is bringing the Blues back to Rock. The foundations were still firmly there, but Anthony has pole vaulted the rock and roll walls with a guitar in one hand and a glass of whiskey in the other. And the party lands center stage with an impact that will stay with you. In the past he has taken on the topic of Blues Rock amongst Blues Purists. And the essence of his response has been that he is there to play his blues and his heart and the rest can love him or hate him. He comes at it from a very honest place and you have to respect the honesty and talent at this mans disposal. He makes no apologies, and nor should he. I encourage you to hear it in his own words here. Anthony truly has a career to be proud of after 12+ albums and his latest, Peace Love and Loud Guitars, just out. He has taken his starting days in Toronto Canada and built a house grounded in honest and hard hitting music. And it must be said, the man is on a crusade to take back music from the industry that in his views has pivoted into telling us what to like from providing us what we like, he hasn’t slowed down a single note. A cause well worth fighting for! Anthony is not just an accomplished musician, but also has a degree as a Blues Historian from the University of Toronto. Including his published thesis on the racial implications of blues and society. A gentleman and a scholar. Blues and Rock are tied together forever and one will never truly be far from the other. Which is what makes Anthony’s concerts so much fun. Anthony is currently touring with Jeremy Howard on Drums and Sean Holland on Bass. And the trio are a force to be reckoned with. Jeremy Howard carries the drum line and handles the unique backing media for the trio. Standing proud he brings every ounce of energy into his beat. The ever present smile throughout the concerts proves you’re not the only one having fun. Sean Holland out of St. Louis MO takes his Jazz influenced bassline mixes in the Blues and serves it all over the rock(s). One look at his face on stage will tell you two things, the first is that he is serious about his craft and the second is that he is having fun doing it! Having spent the last 3 decades working at and perfecting his art, he brings consistency and strength to every song. The band makes use of a unique electronic backing vocal for some of the songs they bring to the stage, something that you don’t see a lot of in the Blues world. And they do it in a way that fills in nicely without overtaking. There’s no lip syncing or dubbing in of vocals to mask or “fix” a song, unlike how it is used as a substitute for pure talent in other genres. It’s something you have to experience first person to truly appreciate. It’s done in such an organic fashion that it took me a minute to figure out what was going on. It fits that naturally. Anthony brings raw power and emotion to the stage each night. Truly a showman, he has the talent and depth to back that up. 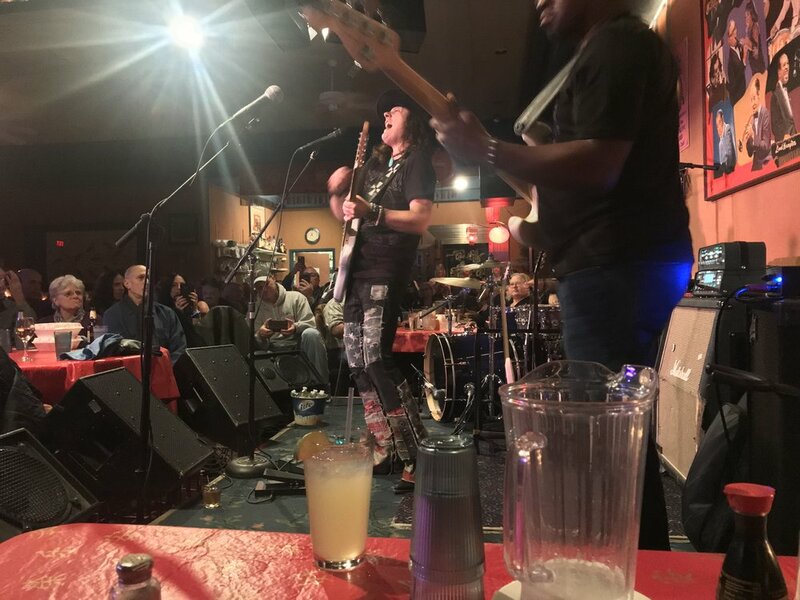 One of the things that some might not expect when they walk into an AG show for the first time is that in addition to his blues and rock chops, the man can bring out the soul singer at a level that truly holds an entire venue rapt with attention. It’s a stark reminder that one of the finest qualities of the blues is the ability to be honest. It’s one of the most honest forms of music out there. No matter the sound or the beat, there’s a deep honesty that prevails through every note, song, and album. Something that comes through, and I feel comfortable in saying this even if I didn’t know the story behind it, is that Anthony embodies the generosity and gratitude for his fans that resonates deeply with the crowds. Seeing that he took these lessons to heart makes me smile, knowing the individual who imparted that sage bit of education came from BB King himself… well that just makes me grin. Anthony’s song “Come Down” is truly a ballad for the man who showed us all how it’s done. And if you listen to the words, and feel the raw emotion involved… you’ll get a shiver when you think about the history that has carried forward like loud echo’s from the past. 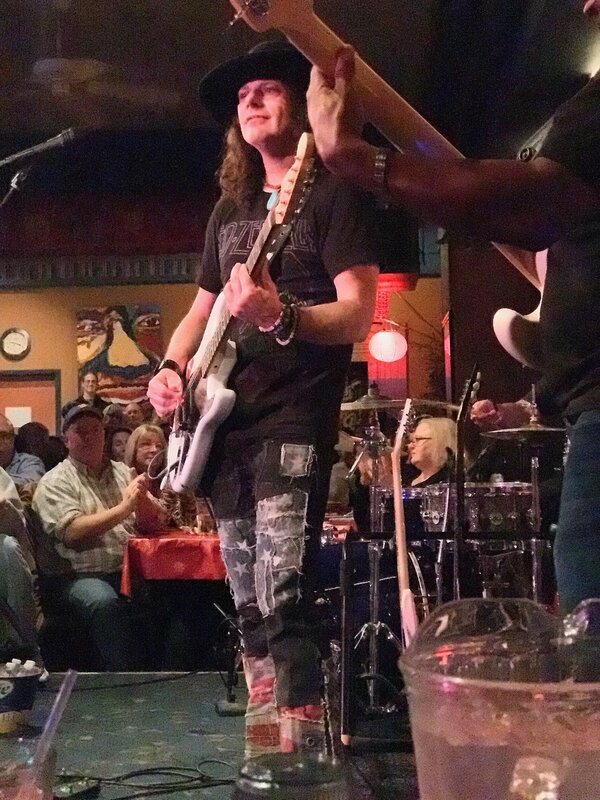 Truly a fun concert to attend, he plays fully with the audience and you get to enjoy the shades of Bobby Rush that stand out amongst the fun “dirty songs” such as White Trash Princess, and the power that comes screaming out of that flying V guitar with The Whiskey Made Me Do It. If you’re looking for that song that covers a lost love, Blues In The First Degree is your song. It’s truly a balanced event to enjoy with the Blues never leaving the forefront of this Blues Rocker. One of my favorites is his Darkest Before The Dawn, it just carries you into the music and carries you through the story and emotion feeling safe and true. I honestly could sit here all night and go through every single song in a concert or on his albums, but it’s best if you hear them yourself. Each and every song throughout a concert has landed fully and thoughtfully for myself. I’ve had the pleasure of seeing Anthony 3 times now over the last year and I’ve walked away with a smile each time. So, for a fantastic night of blues rock, you’ll find no finer touring today than Anthony Gomes, Sean Holland, and Jeremy Howard. Make sure you catch them live, check out the free album, and pick up the latest album too!